You know how sometimes you see a trailer for a movie you've been waiting for, and you get all excited? And sometimes you see a trailer and you think, "Eww yeah, not going to waste my money on that one"? And every once in a while, out of the blue, you see a trailer for a movie you know nothing about, and it hits you between the eyes and makes you think, "I have got to see THAT." That was my introduction to The Grand Budapest Hotel. 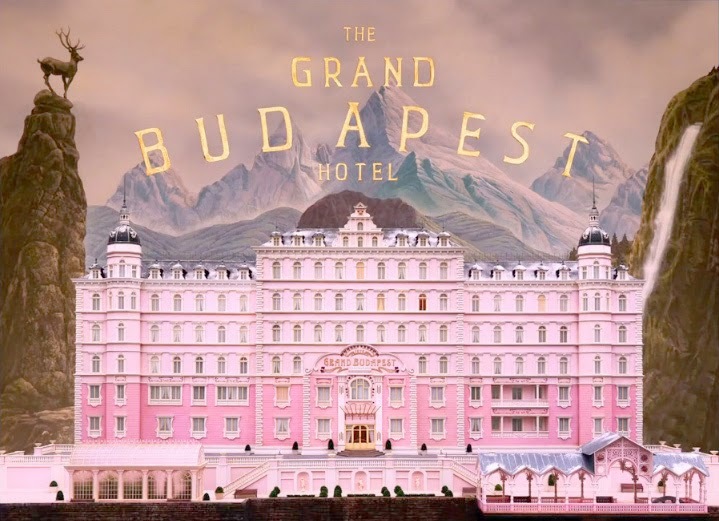 The trailer itself was quirky, with scenes of a huge hotel swathed in pink and Ralph Fiennes fleeing across a snowy mountainside and Tilda Swinton made up as an ancient dowager from another era. 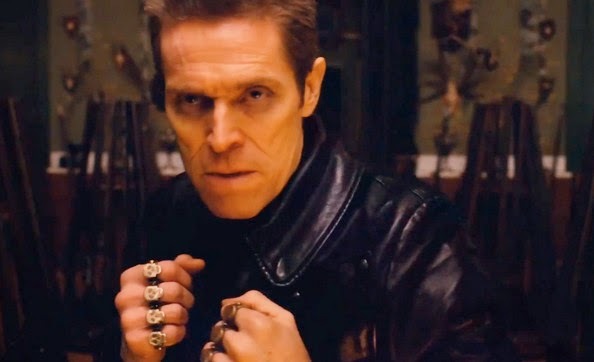 And Willem Dafoe at his Willem Dafoiest. There's only the barest suggestion of the plot: A young bellboy becomes caught up in a tale of romance, intrigue, murder, and art smuggling. As it turns out, that pretty much is the entire plot. But because this is a Wes Anderson movie, it unfolds in the most arabesque and delightful way possible. And also there are a ton of cameos (and of course one of them is Owen Wilson). Precocious Daughter and I loved this movie. We laughed a lot. The Grand Budapest Hotel is by turns sweet, raunchy, improbable, and really, really fun. But as good as it is, I never thought for a moment that it would be a Best Picture contender. First of all, it's a comedy, and comedies don't win Best Picture (the last one that did, and it's only a comedy if you have a pretty dark definition of the word, was 1999's American Beauty. If you're talking comedies that were actually marketed as comedies, you have to go back to 1977 and Annie Hall.). Second, Wes Anderson makes movies that tend to be cult favorites rather than "major motion pictures," like Rushmore and The Darjeeling Limited. Third, there is absolutely nothing socially redeeming or historically significant about The Grand Budapest Hotel. It's just a hell of an enjoyable movie. I was very surprised and extremely happy when this lovely little film won Best Comedy/Musical at the Golden Globes earlier this month. When it scooped up nine Academy Award nominations - including Best Picture, Best Director, and Best Original Screenplay - I was floored. Whether it wins anything or not, I'll be happy if the cast simply shows up on the red carpet together. Go see this movie, Drunkards. I plan to see it again before Oscar night. Two thumbs way up. Liked it. Didn't love it, but I thought Ralph and Willem were BRILLIANT. I came in about half an hour late to it on my mother's premium cable last weekend. Enjoyed thoroughly what I did see. That said, I loved The Royal Tenenbaums and Rushmore just a touch more... I think his movies are so luscious, though. I've been wanting to see this since the trailers first came out. Needless to say, I don't have a Precocious Daughter. I only have a Neanderthal Husband and his sidekick Man-Child. Getting them to see anything I want to see requires an act of Congress. This one's been on my "have got to see" list for ages, especially since it was playing at the tiny art house theater, and I should never pass up the opportunity to support a theater that shows everything from high falutin' avant garde films to cheesy seventies horror flicks, complete with panel discussions. Anyway I'm tickled to know that once I do see it it'll have been worth the wait.